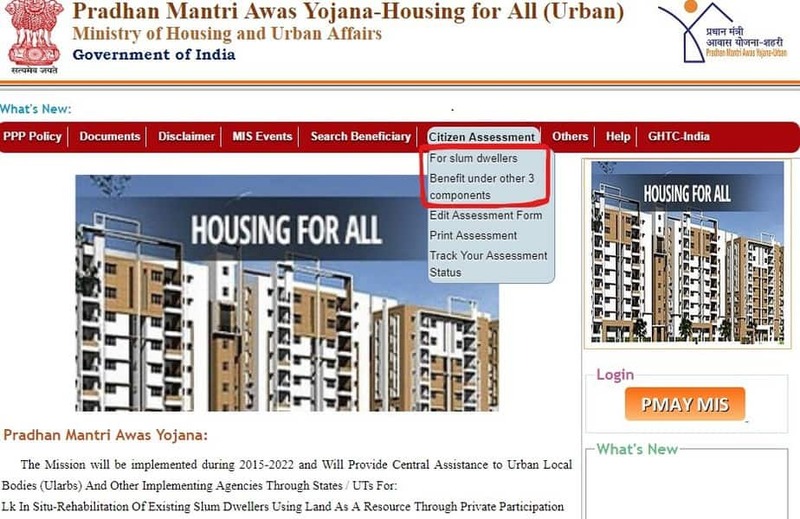 Pradhan Mantri Awas Yojana (PMAY) Online form 2019 and PM awas yojana list 2019 for third phase are available now. Eligible people can fill the PM awas yojana application form and can avail the benefit of the scheme. PM Awas Yojana is an initiative of Indian Government to provide housing facility to the poor section of Urban areas (also rural area) on affordable rates. It was launched in 2015 and till date, two phases have been completed. PM Awas Yojana list 2019 and apply online through below link. A large no of people (beneficiaries) have been identified from various states and Union Territories for availing the benefit and construction of houses for these beneficiaries is going on. Latest: Application form are currently not available right now. Keep checking this page to know when it will be available. 3.2 How to check PMAY Application Status? 3.3 How to print the PMAY application form? If you are also an eligible candidate and want to avail the benefit of this scheme, then you must collect all the necessary information before filling the PM Awas Yojana application form. In this article, you will get all the information in detail. It includes a brief detail about the scheme, eligibility, procedure to fill online application, and other important details. The maximum age limit of the beneficiary is 70 years. Beneficiary or any of his/her family member must not have any dwelling/ pucca house in any part of the India. Beneficiary must be from EWS category that means the annual income of the beneficiary should be less than 3 lakhs. Beneficiary must have an annual income between 3 lakhs to 6 lakhs if he/she is from LIG (Low Income Group). Membership of one adult female member of the family is mandatory in ownership of the house. It means the houses provided under this scheme shall be owned individually by an adult female member or jointly with males. PMAY Application can be obtained and filled through two methods. Applicants can either obtain the application form at a nominal cost of Rs.25/- from the Common Service Centres established by the government of states and Union Territories. The second mode of registration is the online mode in which applicants can register through the official website of the Ministry. As application for third phase are currently available, eligible candidates can apply. On the homepage of the website, you have to click on the “Citizen Assessment”. You have to select the relevant option from “for slum dwellers” and “benefits under other 3 components”. On selecting the relevant option, you will be redirected to the Check Aadhar No. Existence page where you have to enter your Aadhar No. in the space provided. You will be redirected to the application page. Here you have to fill all the details such as name of the beneficiary, contact details, all personal details, income details, bank account and all the other required information. Once you have filled all the details in the form, you have to mark the disclaimer, enter the captcha code and click on save option. Application is complete and you can take a printout of the filled in application form. Applicants must ensure that they fill application form only at the Ministry’s official website or at the registered Common Service Centre. Other than these two no other medium is given authority for registration of beneficiaries. Applicants must be ready with all the necessary documents before filling the application form. Applicants must fill details accurately. Application submitted with false data will be rejected. How to check PMAY Application Status? After filling the application form you can check the application status any time you want. Application status can be checked through two methods viz. by application No. or by entering other personal details. Visit portal – The very first step is to visit http://pmaymis.gov.in. Citizen Assessment option – Search “Citizen Assessment” option on the homepage. Select relevant option – Click on “Track Your Assessment Status”. Hit the track button – From the two options hit “By Assessment ID” button. Enter details – Enter your assessment ID and Mobile No. and click on submit option. Check the status – Now assessment status will appear on the screen and you can view your status. Select “Track Your Assessment Status”. Click on “by name, father’s name & mobile no.” button. Enter name, mobile no., city, district in the space provided and hit the submit button. Clicking on submit button, assessment option will appear on the screen. How to print the PMAY application form? Once you have successfully filled the application form, you can download and take a printout of it for future references. On the homepage click on “Citizen assessment” tab. Now you have to assess the application form either by clicking on “By Name, Father’s Name & Mobile No.” or “by assessment ID”. Enter all the details as per your selection. Click on “Print” option and get your assessment form printed. Aadhaar card- It is compulsory for all the candidates to provide their Aadhaar card details. Without Aadhaar Card no one can apply. PM Awas Yojana is a national scheme launched by the Ministry of Housing and Urban Affairs, Government of India in the year 2015. PMAY was started with an aim of providing affordable housing to urban poor and other economically weaker section of the country. It is also known as “Housing for all”. Under PMAY scheme government provides an interest subsidy of 6.5% on housing loans to the beneficiaries for 20 years under Credit Link Subsidy Scheme (CLSS). Houses under this scheme are constructed through an eco-friendly technology. PMAY Phase-1 from April 2015 to March 2017- It was aimed to cover 100 cities. PMAY Phase-2 from April 2017 to March 2019- It covers additional 200 cities. PMAY Phase-3 from April 2019 to March 2022- It is to cover remaining cities. *Data provided above is up to February 2018. Hope you have understood and found what you were looking for in case you have any doubt related to PMAY scheme of GOI, you can ask us in the discussion section below and our team will help you with the issue as soon as possible. Pmay is very good scheme launched by the government of India and weaker section of the country should avail the benefit. For that, we are regularly monitoring any update from the authority and communicating to our reader in easy to understand language. Therefore, you can bookmark us and like our Facebook page to stay updated of all the important instruction of PMAY scheme like online form, list release, application print, RH housing report etc. All the best for PM Awas Yojana application and name in PMAY list 2019. I have one query related to Pradhan Mantri Awas Yojana. Iam in telangana state. But am trying to apply PMAY. And provided housing facility to the poor section of urban areas. And my family also under this category. And the telangana poor people eligible or not the scheme. Please help me and provide the information to apply the PMAY. I am Narayan Pal (son of laxmi Pal),22 years old residing at rental house(slum) at Ayodhya nagar,Near bijli office,New changorabhata,raipur,chhattisgarh-492001. My Family comprises of 4 members,Father,Mother,and a younger brothers,who is studying.Family is solely dependent on me,and i am sole Earner in the family. My mother(laxmi Pal)used to work as a Housemaid,and wanted me and my brother to study till …We have seen a phase in life when we had so little to eat at home that we had to ration food within the family. Many a times I used to sleep with an empty stomach.With my mother’s hardwork today I am involved in service sector,and working as a office boy with M/s srei equipment Finance Ltd Raipur Branch from past 3 years.You can take feedback regarding my overall work performance from my company. We have a single room with no water and sanitation facility,It is very difficult to stay in a single room,and are facing lots of hygiene,Health,and other related problems around our residence,and dont feel safe at all.We ate,sleep,cook,and my brother study in that single room. we are in urgent need of a house and have applied with different government departments during past 3 years,but nobody has responded. I have applied for a House under Pradhan Mantri Awas Yojna in the name of head of the family,my mother Mrs Laxmi Pal 42 years old on 03-11-2017.
attached -acknowledgement receipt,and other documents. kindly consider my accomadation request under Slum Redevelopment or Pradhan-Mantri Awas Yojna,so that i can take care of my family,and continue my younger brother to complete his studies. Hme makan Ki Bht jarurat hai. Please hame bahut hi awasyakta hai pmay awas Mai ek poor man hunh please pm Modi aap Ko sat sat naman. Sir mare raheva mate gar nathi. Krupa karine mane ek gar manjur kari appo. sir hamare village me koi padha likha nhi sab berozgar hai . esly hamare village ka vikas nahi ho raha ..
sir mene online line for bharwaya tha meri umra 65 se upar he me aur meri biwi kiraye ke makan par rahte he kam kar apna gujar basar kar rahe he kriypa hame bhi PMY ke tahat ghar pradan karne ki kripya kar….. I am not able to see “Citizen Assesment” option on the official website. Can anybody help? I, try to take loan for plot of land of 50 square yards and construct the house, but any bank is not giving me loan, they are asking my income and my income tax return, I have no any house, I want to make my own house, please help me in getting loan under PMAY housing loan. Can avail the benefit of single male member of property ownership? sir i am very poor person i repeate gramyasabha of my application form but i can;t success .for pradhanmantri awas . recently I have purchase new home in navi mumbai in February 2019 area 35.50 sqmtr and home loan from ICICI bank. banker could not or forget to apply for PMAY subsidy at the time of pre-sanction home load. however, home loan disbursed in march 2019.
please help with the procedure and to whom should i approach with relevant application and documentation. Kya post kare vohi vali baat hai ek anaar or so bimar ab ye anaar Kise khane ko milega ye pta nhi……..
Pradhan mantri yojana is not found. I hv taken a home loan on december 2017…. 1st disbursement was on feb 2018…PMAY registration was on july 2018…but i dont get amount of pmay till march 2019…when i check my status…pmay says “no records found”….I satisfies all the pmay criteria….what to do now??? Is there any possibility to reject my application?? ?then this should be displayed…how is it possible? Main jharkhand ke rahne wala hu. mera name Mithilesh Kumar Mehta hai . Mera ghar nhi hone ke Karan bahut dukaton ka samna karna padta hai so please help kijiye. Hello Sir,Myself Divya Modi Taken a House in Kharghar Navi Mumbai,800 sq ft.taken a Home loan with SBI Bank in 2014,Can I Apply for PMAY Scheme,Having Annual Income less then 4.0 Lakh Rs. hi sir, i have house size 706sqft ,iam self employee my monthaly income 25000 i didnt have name of female in house registry i am eligible for subsidy ??? Mera name dinanath Kushwaha hai,Mai majdur hoo,roj majduri karta hoon to roj bhojan karta hoon.nahi Kam milta hai to humare ghar upwaas hota hai. Atah humare pas khane ke lie paise nahi hai to ghar banwane lie paise Mai kaha se laaunga. Es lie humpar bhi aap dyan de! ,मेरा नाम गणेश है. मैं कोळी का हू मेरे गावं मे मुझे तो घर है ही नहीं और मेरे गावं मे एकही घर नहीं आया आया तोही वे ग्रामपंचायतचे सदस्य घर का नाम तो भी बता नही देते. हमारे गाव मे रोड मे अच्छा है तो भी बता देना. गाव मे पिने को भी पाणी नाही. मनुष्य को पानी नही तो नही जनावर को भी पाणी नाही. मेरे मुझसे की रिक्वेस्ट है की हमारे गाव मे घरकुल और रस्ता सुधार देंगे . और पानी की बी सुविधा सुधाकर देंगे ऐसे मेरी रिक्वेस्ट है. पीएम को मेरी इतणी रिक्वेस्ट है. I hope next time pmay loan after elecation confirmed to my house. I am receiving the home loan from hdfc Bank in 2014 I am eligible or not eligible for this benefit pls tell me. sir mera ghar nhi hai plzz mai aap se nivedhan karta hu ki mughe ghar dhene mai sahaita kare ……..
i must welcom my sir . I own 300 sqft house on 1.25 send land. We are under EWS category and when we ask the bank for pmay loan for enhancement of my house the bak demand us to produe the income certificate of rupees oneand a half lakh. I purchased flat on September 2016. I was not applied for the PMAY scheme at that time, though I was eligible for this PMAY scheme (phase – I) due to not aware of this scheme. How do I approach for getting this benefit of PMAY scheme now. May request for proper guidance may be given on the above mentioned case….. I am trying to fill the form. Whenever i enter aadhar card with name and enter the submit button. It refresh the pages. it doesn’t go in registration page. Kindly help me. Thanks! What if bpl card holder is widow with 3 children & doesn’t have a pinch of land to sow as a construction site ? How PMAY WILL HELP ?